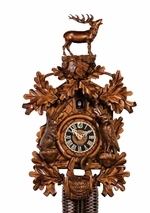 Your Mechanical Cuckoo Clock is warranted to be free of defects in materials and workmanship for a period of two years. Quartz Cuckoo Clocks have a 1 year warranty. Our obligation under this warranty is limited to the repair or replacement of the defective clock without charge. from My Cuckoo Clocks and is not transferable. You must have a copy of your sales receipt. Warranty service is available for returning the clock, postage prepaid by customer. It is suggested you insure the clock to cover any damage that may occur during shipment. for return & repair information. The following situations are not covered under this warranty. Damage sustained while in transit or through misuse and/or abuse. Chains off the wheels or tangled. Any problems caused by not following the instructions in the instruction brochure packed with your clock. Repairs done by anyone other than an authorized SERVICE CENTER.